This week the International Quilt Festival is taking place at the George R Brown Convention Centre in Downtown Houston. I'm not a quilter but I can appreciate the artistry and skill involved. And I love quilts that tell a story or illustrate a specific social or political issue. I've never visited before but Nimblefingers, the yarn store where I teach, are vending at the show for the first time. So I organized a little trip for members of my Yak & Yarn group on Thursday, the opening day and I'll be working on the Nimblefingers stand on the day this blog post goes live. This is a huge event with over 55,000 quilt lovers traveling from 35 different countries to attend. It's part marketplace, part quilt competition and part quilt exhibition. There are also a huge number of classes taking places. I headed first to the yarn sellers (they sell everything at the quilt show - buttons, fabric, frames, dyes, embroidery, bags, sewing machines...) just to see what they had going on and have a little squish: The Hen House , Threads & Ewe , WC Mercantile , Yarnorama all from Texas and RedFish DyeWorks from California. "Quilts can certainly carry social and cultural implications. Here, they translate specific concerns into material form, and explore a wide range of issues—both personal and political. Ideas are made concrete, and a quilt becomes an expression of the complexities that make up a life in the world." The 70,273 Project is a worldwide collaborative art project. The quilts are made up of blocks of fabric marked with two red crosses on a white background to commemorate the reported number of physically and mentally disabled people killed by the Nazi regime between January 1940 and August 1941. Jeanne Hewell-Chambers is collecting 70,273 quilt blocks from around the world. Around 7,000 or one tenth of the blocks were on display at the quilt festival this week. The blocks will appear at Rochester, Lincoln and Durham Cathedrals in the UK in January 2018, to mark National Holocaust Memorial Day. HERstory: A CELEBRATION OF STRONG WOMEN was an amazing exhibit organized by Susanne Jones who had asked for submissions of quilts of a woman who had inspired them since women attained the right to vote in 1920. Quilts had been sent in from 8 countries. Susanne said I could take photos so long as I attributed the quilter and the collection. I picked out Nina Simone: A Theme with Variations by Sherri Culver because I love her songs and her voice. 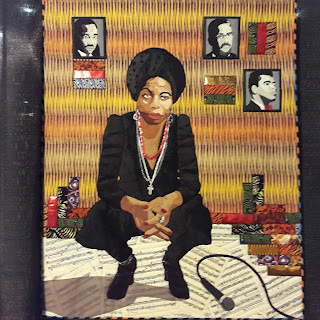 And it reminded me of the amazing crochet mural currently on display of Nina Simone in Raleigh North Carolina as part of the Love Across the USA community art project. It's funny how things lead back to crochet for me. I hope you've found this slightly off topic post interesting... most people I know who crochet and knit are interested in other crafts. Have a super week y'all!! What a fun post. Thanks for sharing! It was such a fun day Nicole. Glad you enjoyed my post.